Lions, tigers and bears OH MY!!! 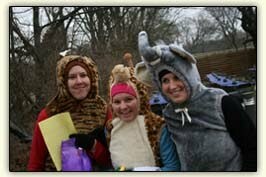 A Nashville favorite, the Zoo Run Run, was held last Saturday at the Nashville Zoo. The Zoo shuts down early for a unique afternoon 5k race through the primate, reptile and big cat exhibits. Rumor has it that a few slow runners go missing each year.